The concept of the Photographic Museum of Ontario was formulated in 2009. The goal for the museum was to show people, photography of the past (before the digital era) with its many unique features, such as how pictures were taken, and to show the future that digital era will bring to us. What state is the Museum at? The Photographic Museum is in its final stages of preparing the business proposal. With this proposal we hope to interest corporate and private sponsors. We are waiting for the final approval of the new museum’s designs, but we have started raising funds for the museum. I had a great meeting with Jamie Robinson and the other members from Metrolinx today. Very positive outlook for the museum and the Kodak building. Moving forward with our plans for the museum. There are many ways to help support the Photographic Museum of Ontario. You can simply help spread the word. Be an active member of our fund raising team or even be a board member. 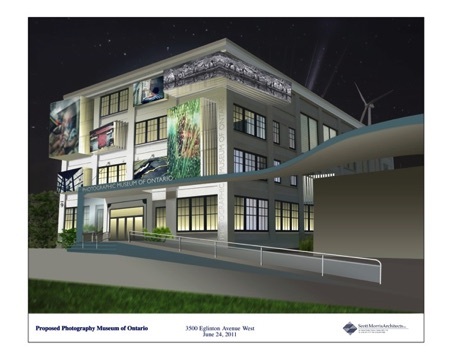 The more people who know about Photographic Museum of Ontario, the better it will help to increase awareness and raise the profile of this project. We have almost 6 million people the live in the GTA and over 13 million that live in Ontario. If 1 out of 4 people of Ontario donated just one loonie, that would be over 3 million dollars and that would be enough to cover the basic costs and to get the renovations started. Write a mail to your favorite newspaper, magazine or radio station about the project and tell them what you like about the project and why you think it would be relevant to other people too and worth an article. Tell your friends about the project, how they can support it and why you think it would be a great idea for them to do it. If you are a journalist - Write an article or do a documentary piece about us. We are more than happy to do an interview by phone, in your studio or on location. If you work in the photo industry - We are looking for old, unwanted cameras, and other photographic equipments. Not everyone in the world has seen (or even knows) about some of the older cameras of our past. The cameras or equipments, do not have to actually work, just look good.